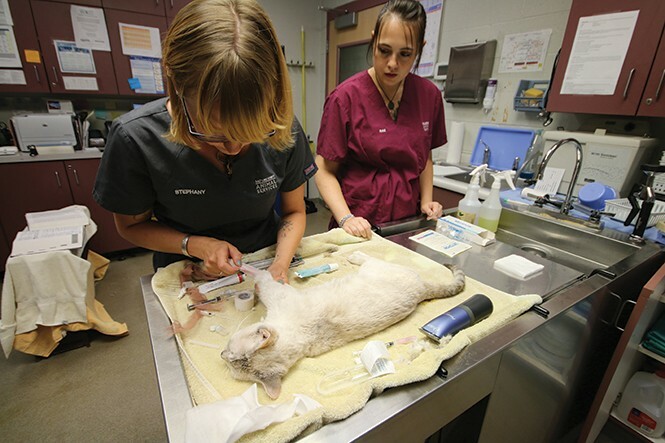 Salt Lake County veterinary technicians Stephany Blandard and Rae Varian perform a mastectomy on Jolie, a stray cat. Jolie survived the procedure and was later adopted. Cats, dogs, kittens, whatever—five years ago, if there wasn't room at the Salt Lake County Animal Services shelter, or if an animal were too wild or misbehaved to be adopted, they'd be killed. But the age-old method of euthanizing large swathes of the pet population to deal with overcrowding proved ineffective, and widespread killing didn't make anyone—especially the people carrying out the killing—feel good. So in 2010, Salt Lake County adopted a no-kill ordinance, which means that at least 90 percent of all of the animals it takes in will be adopted, placed with a different rescue shelter or returned to its previous humans. In 2014, animal-control officials say the county achieved a 94 percent discharge rate, meaning that 6 percent of the 8,700 animals it took in were euthanized, usually for health reasons. The success of the county's program has hinged on a few key factors, including the simple ethic that there is no cap on the number of animals that can be housed at the shelter. But it's not as if the county animal shelter is hoarding pets. Callista Pearson, communications manager for Salt Lake County Animal Services, says the shelter has aggressively focused on adoption programs like the "Century Club," where animals that have been at the shelter for 100 days or more can be adopted without fees and are given free vaccinations for life. For animals with behavior problems, Pearson says specialists work to rehabilitate these dogs and help see to it that they are adopted. Other pets, Pearson says, are sometimes moved to other animal shelters that might be able to better care for their needs, or just put them in front of new adopters. And kittens under the age of roughly two months, which need to be bottle-fed, are temporarily adopted by folks who take care of their every need until they are strong enough to be permanently adopted. Prior to the no-kill program, these kitten litters would have been killed. While traditional pets—cats and dogs—represent the largest percentage of animals flowing into the shelter (last week there were 228 cats in the shelter and typically between 60 to 80 dogs), feral cats also end up there. Wild and wily enough to survive without human contact, feral cats—or "community cats," as animal advocates refer to them—represented a small, though particularly vulnerable portion of the shelter's annual population before the no-kill ordinance was adopted. Because feral cats aren't adoptable, Pearson says they were almost always euthanized. But cat overpopulation cannot easily be solved by killing alone. The philosophy to deal with these cats today, Pearson says, is called "trap, neuter and release," or TNR. Under this program, Salt Lake County neutered 370 feral cats in 2013, 142 in 2014 and 453 in 2015. Most of these cats, Pearson says, were released back into the cat colonies where they were found. Temma Martin, public relations specialist for Best Friends Animal Society, says TNR programs like Salt Lake County's are more effective at reducing unwanted litters as well as nuisances from wild cats, than killing. Once a feral cat is killed or moved away from its turf, Martin says other cats move in. Releasing the cats back into their colony after they've been neutered, she says, cuts down on competition and infighting. "Decades of research has shown that the old way of doing it—trapping them, taking them to shelters and killing them—doesn't work," Martin says. "There are always going to be cats. Unfortunately, people let cats go." Best Friends has set its sights on making the entire state of Utah a no-kill zone by 2019. So far, Martin says 54 shelters and rescue groups are moving toward no-kill status, and 27 communities in the state have already reached the 90 percent no-kill mark. Since Best Friends began advocating for no-kill ordinances in 2000, the number of pets that died in animal shelters in Utah has dropped from 46,000 to 13,800 in 2014. Indeed, the biggest hurdle to reaching no-kill status statewide, Martin says, is with cats, which made up 80 percent, or roughly 11,000, of the animals killed in shelters last year. While the statewide cat save-rate is 75 percent, dogs fare far better with a 93 percent save-rate. "Our biggest focus is how to get more cats spayed and neutered, get more people to adopt cats and basically save the cats because that's what's holding us back right now," Martin says. When it comes to breeding, cats are a lot more like rabbits than one might assume. Deann Shepherd, director of marketing and communications at the Humane Society of Utah, says a cat reaches maturity at four months, can have two to three litters of up to five kittens per year, and this breeding cycle can continue for up to a decade. This means the average cat, if left fertile, could produce around 150 kittens. And when one really starts to crunch the numbers, Shepherd says some studies have shown that during one single, frisky cat's lifetime, tens of thousands of cats could be born under her family tree. Where some animal shelters choose which animals they take in, Shepherd says the Humane Society accepts every animal that turns up at its door. Because of this, Shepherd says the Humane Society is not an avowed no-kill facility. But so far in 2015, Shepherd says the Humane Society has taken in 10,937 animals and released to adoption or other shelters 8,705 animals—a 91 percent release rate that places it in no-kill range. "That's pretty amazing because we bring everything in," Shepherd says. Like the county's shelter, Shepherd says the Humane Society has gotten creative as it has tried to cut down on the number of animals it must kill. This summer, Shepherd says adoption fees for cats were waived. The Humane Society also offers an adoption program, where office workers can adopt cats for short periods. "We've just been giving them away," Shepherd says of cats. "We will not euthanize any adoptable animals." The 10 percent of animals that can be killed, even in no-kill facilities, provides much-needed leeway for animals that are terminally ill or suffer from some other ailments. The ability to euthanize, Shepherd says, is important to ensure that suffering animals can die in a humane manner. "We have to look at the quality of life of the animal, not just the fact that we're not euthanizing it," Shepherd says. "We don't want to say 'We're no-kill' and just hold the animal for an indefinite amount of time even if it is not the right thing or best thing to do for the animal." In May, Sandy City adopted a no-kill ordinance for its Department of Animal Services. Ian Williams, the city's director of animal services, says the building is being remodeled to help accommodate the larger number of cats. Williams says he's already trapped, neutered and released 45 feral cats since June. In April, prior to the city council's adoption of the no-kill ordinance, all 45 would have been euthanized. The gas chamber at the Sandy shelter has been dismantled, making way for a new era of dealing with the city's animals that Williams and his employees look forward to. "All of us in this job are here because we love animals," Williams says. "We've never enjoyed killing the animals."